You can call this a 30 day challenge. 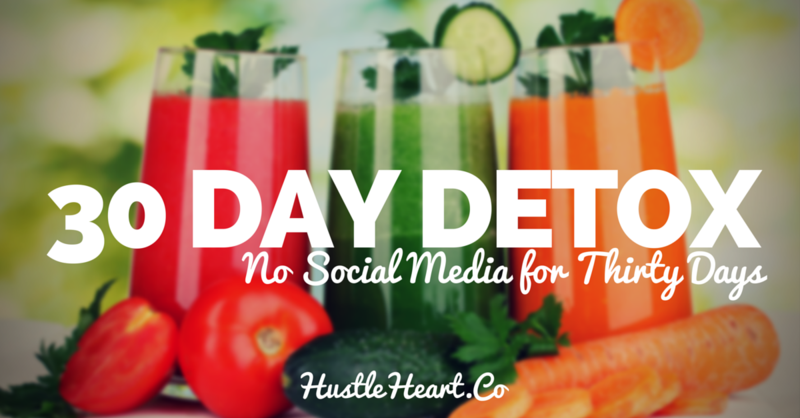 You can call it a social media “detox.” In fact, that’s what I’m calling it. My internet friend Jason Zook has done it and written about it as well. Social media has always treated me well. It helped me launch my first website back in the days when organic reach on Facebook was massive. Then it helped me launch a Jiu Jitsu company when I was truly much better at social media than running a company (and jiu jitsu for that matter). But I think there’s also a darker side of it: the need to consume content. More specifically: other people’s content. I don’t watch cat videos or other BS on the web. I read amazing articles from Barrett Brooks, Jason Zook, Paul Jarvis, Nathan Barry, Chase Reeves, and lots of others. In fact, all of those are links to great articles you should read. But the problem is that as much as reading those articles and watching videos and snapchat stories from Mike Vacanti, Bobby Hundreds and Gary Vaynerchuk (again, all links to what I believe to be the best content on the web) leaves MUCH LESS time for creation. I’ve blocked my news feed on Facebook, unfollowed all of the negative vitriol-spewing people on Twitter, Instagram, and Snapchat, so it’s not negativity that distracts me, but the never ending pursuit of more content. What I’ll probably miss most, to be honest, is Mike Vacanti’s spaps and the Chang&Todd Experience on Snapchat. *PS – This is so much fun to say now that we have two. Also, I will still be emailing during this time. I’m tired of getting caught up in the fake success of others that they try to promote over social. I’m tired of letting other people curate my life. Like I said, I’m building something totally new and I feel like my to-do list is always half filled with things to watch and read. This isn’t an experiment that I’ll report on, but more of a short manifesto that I hope you take to heart as well. Start treating your success like an obligation and stop screwing around.